Features a message from our president, and introduces Five Commitments of JDC Corporation. Introduces our management philosophy and policy. Lists the path taken by our company from its inception in 1951 until the present. 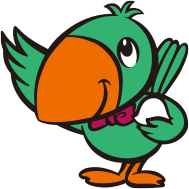 JDC’s mascot character, who works with us. Our mascot, Kokudo-kun, facilitates communication with local residents, as well as finding and removing potential hidden risks in construction sites. Our technology maintains and expands the social infrastructure essential to people's everyday lives. Japanese Copyright © JDC Corporation. All Rights Reserved.